Good morning! I used Amber's final Viva La Verve sketch for November, VLVNov04 (which means, yea! I finished all of the sketches this month!). The "twist" was to use the colors purple, chocolate and vanilla. 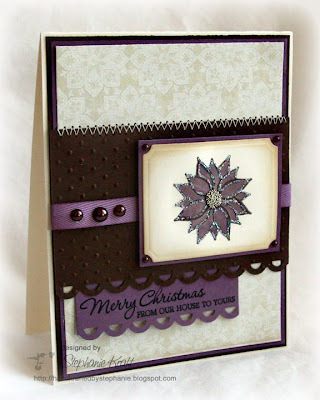 I stamped the poinsettia from Verve's Poinsettia Christmas and colored it with Copic markers. I added tiny sterling microbeads to the center of it and Star Dust stickles around each petal. Accessories: Labels Nestabilities (Spellbinders), Swiss Dots embossing folder (Provo Craft), Apron Lace border punch (Fiskars), Markers (Copic), Sterling microbeads (Martha Stewart), Ribbon (Papertrey Ink), Chocolate pearls (Kaisercraft), Foam tape, Thread, Sewing machine.